Shipman Landscape & Construction provides comprehensive services including consultation, project design, landscape construction, management, and maintenance. Our Projects range from intimate courtyards to large landscape infrastructure for residential, commercial, and civic clientele. We invite you to preview a sample of projects in our gallery that range in both style and complexity. 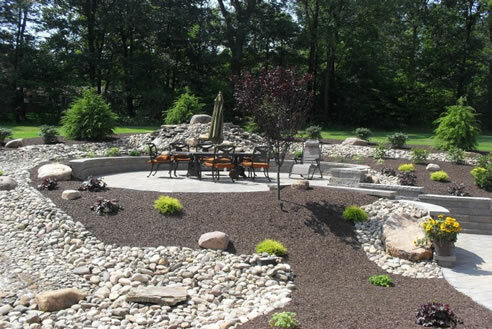 Shipman Landscapes offers an initial, no obligation consultation for any landscape project you may be considering. With close to 20 years serving Central PA in the landscape profession, we welcome the opportunity to provide service to both our current and future clientele. Our specialty is client-centered design. All aspects of property are analyzed to produce a design that accommodates the clients lifestyle, compliments the style of the home, and enhances the orientation and topography of the lot. Our clients benefit from superior attention to detail and quality project management from initial concept to completion of the construction process. A well-designed landscape can increase property values 10-15%. Let us prepare a landscape that will increase value of your property and enhance the livability of your home. Copyright © 2007-2009 Shipman Landscape & Construction.